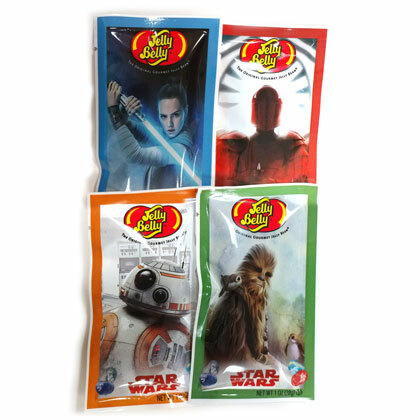 Jelly Belly Star Wars The Last Jedi party favor bags. Each bag is filled with 1 ounce selection of Jelly Belly assorted jelly beans. 2 packs per order. Style will vary depending on availability. Four styles include Rey, BB-8, Snoke's guards, and most importantly Porgs with Chewbacca. Galaxy mix includes sparkling berry blue, blueberry, cream soda, very cherry, grape soda and wild blackberry.